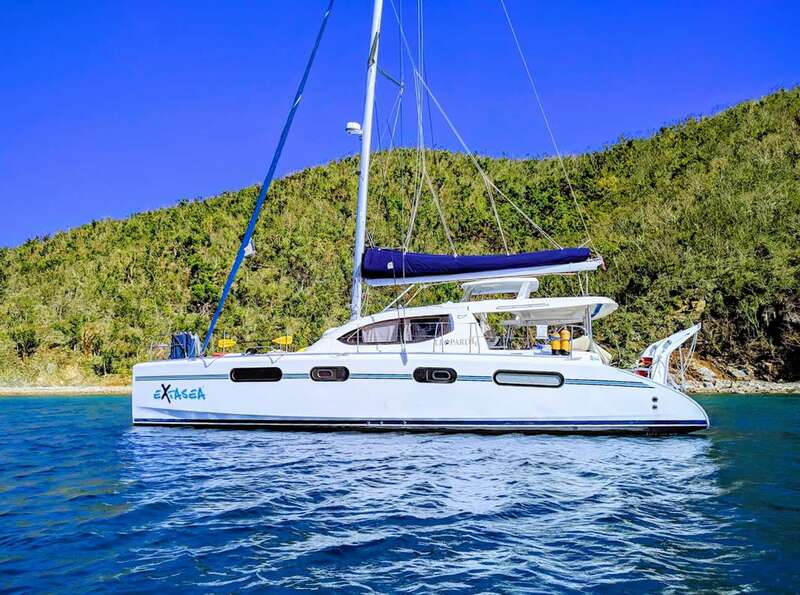 Catamaran ExtaSea 2 is a 2009, 46' Robertson and Caine catamaran offering crewed yacht charters in the BVI & USVI. 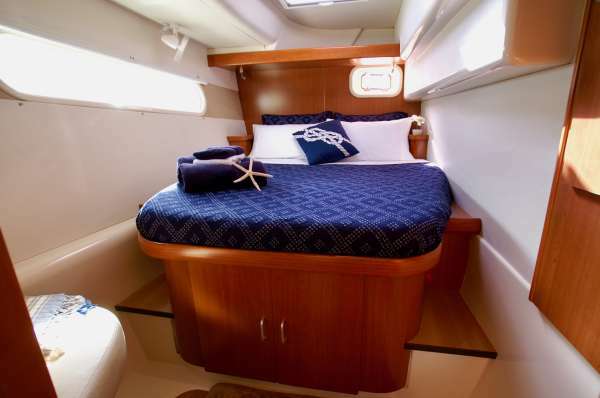 She features on-board scuba diving for certified guests and accommodations for up to 6 guests in 3 Queen cabins. 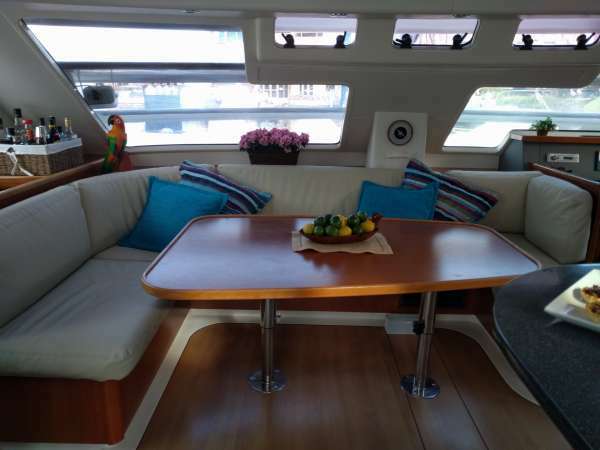 Catamaran Nova is a Carefree Yacht Charters affordable pick for families, couples, divers, or special occasions. Rates from $12,000 to $16,000. View availability and rate details. To learn more about this crew or for further details about EXTASEA 2, call us in our South Florida office at (954) 980-9281, toll free at (888) 670-6884 or fill out our Quick Request Form. 48HR turns. Please inquire for 24 hour turns. 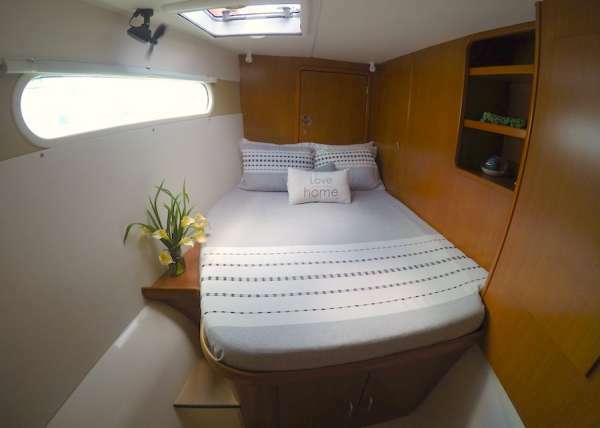 ***BABIES WELCOME ABOARD EXTASEA2*** HALF-BOARD OPTION: Includes all breakfasts, 4 lunches & 3 dinners aboard, all other meals ashore at client expense ($150 off pp) 2@$11,700 3@$12,550 4@$13,400 5@14,250 6@$15,100 LOCAL FARE OPTION: Includes all breakfasts, 5 lunches & 6 dinners aboard, all other meals ashore at client expense ($75 off pp) 2@$11,850 3@$12,775 4@$13,700 5@14,625 6@$15,550 CHRISTMAS/NEW YEARS: 4 guest minimum, 7 night minimum. 1-4@$15,400 5@$16,500 6@$17,600 Christmas must end by 12/28. 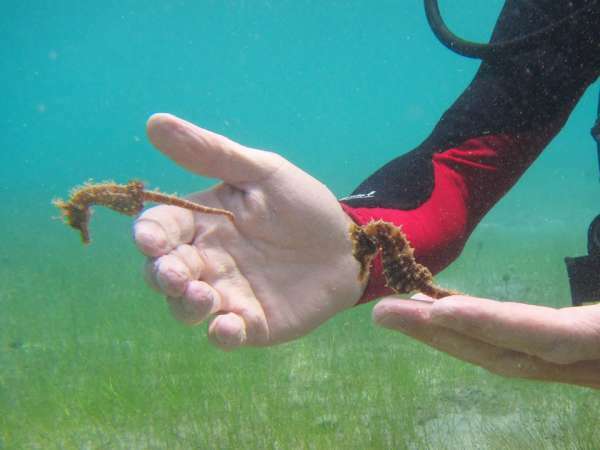 New Year's start 12/29 or later. .
Costs: $35 per person per dive for certified divers. 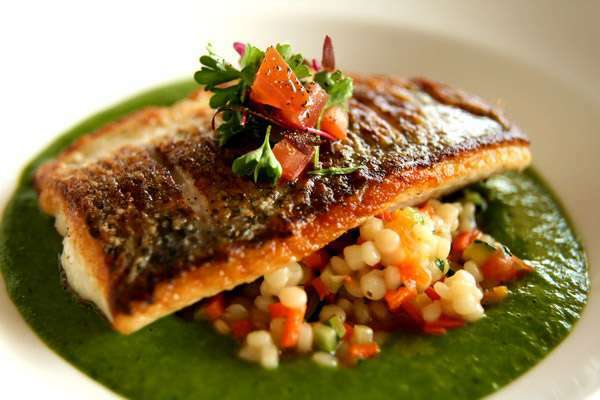 The food on EXTASEA2 is delicious ; freshly cooked, healthy and well balanced. 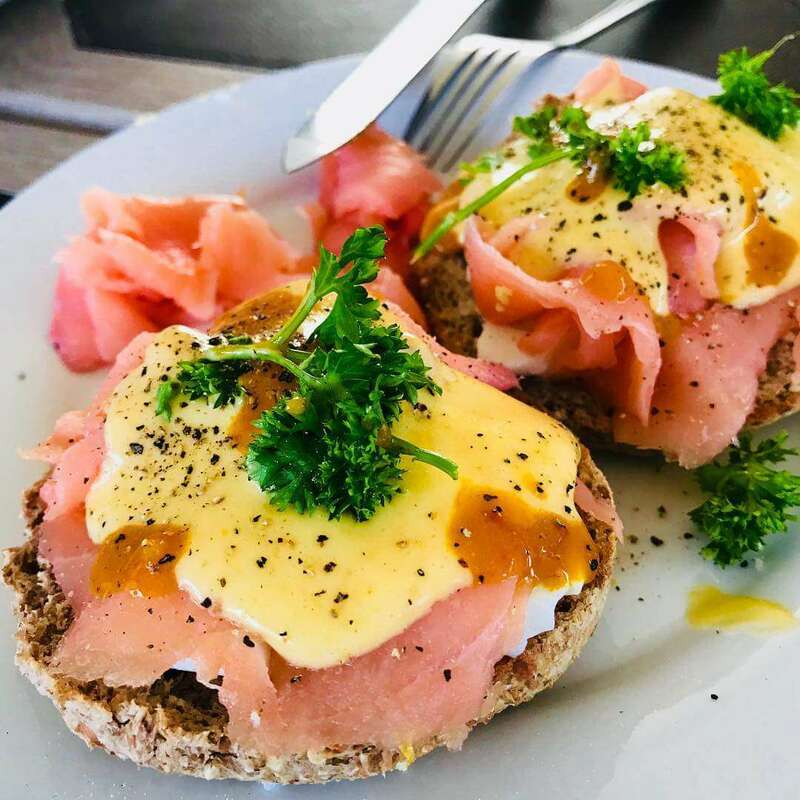 Having traveled extensively, Lesley brings you varied and favorite dishes from around the world. 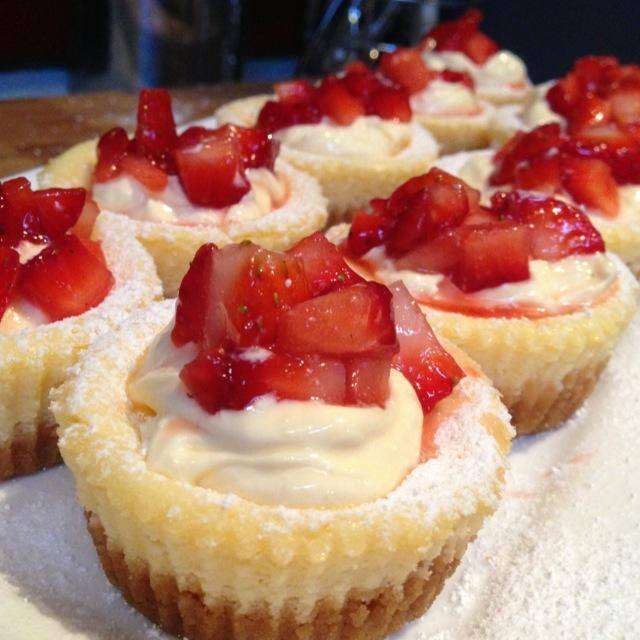 She is able to cater for most dietary requirements, and personally follows a Gluten-Free diet. All menus are individually planned according to guests requests and dietary preferences. This is a small selection of some of her mouth-watering dishes. *Banana or Blueberry Pancakes with Honey bacon on the side. light and delicious dishes, we add to and change according to the availability of the freshest seasonal ingredients. * Tortillas. Build your own scrumptious tortilla, a selection of fillings including fish, chicken, beef, tomato salsa, cheese, lettuce, guacamole and sour cream. Cocktail Specials – Pina Collada, Pain Killer, Dark n Stormy, Bushwacker, Margarita Classic, Caipirina or a ‘Virgin’ Cocktail which appeals to all ages. Your nightly “Dinner Party” served in our spacious cockpit under star studded skies. FAMILY MENUS – Suitable for the younger members of the family will be planned according to your preference sheets. Soft drinks, sodas, water, beers and spirits are available all day for your enjoyment on Extasea. Our Spirits include: Smirnoff Vodka, Gordons Gin, Johnny Walker Red Label, Jose Cuervo Tequila, Bailey’s, Jack Daniels, Cruzan Rum, Goslings Rum, Bacardi, Hennessy Brandy. Red and/or White Wines. We also have a selection of liqueurs for after dinner. Just wanted to tell you what an incredible vacation we had on ExtaSea 2! 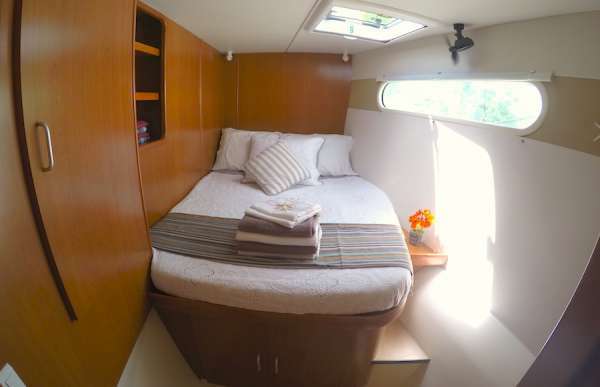 The catamaran was roomy and well kept. Mike and Lesley are such a wonderful couple and they complement one another perfectly. Mike is an outstanding sailor and divemaster and Lesley is a whiz in the galley. 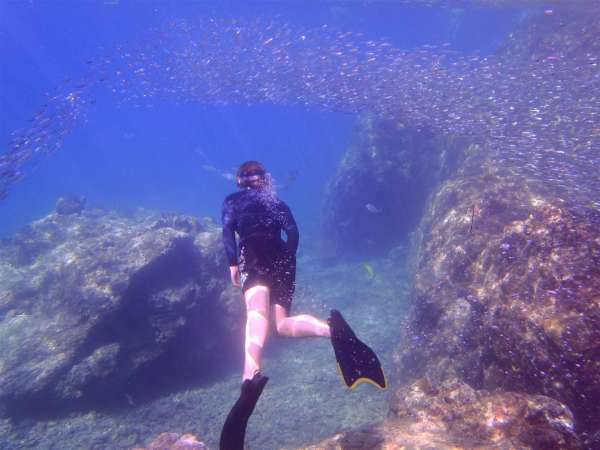 Our group of four enjoyed scuba diving at well chosen sites, peaceful evenings in sheltered harbors and fun days ashore exploring new towns and beach bars. Every meal we had on board was more amazing than the one before! Lesley is a chef...not a cook! How she prepared such a variety of dishes in such a small area was nothing short of miraculous! 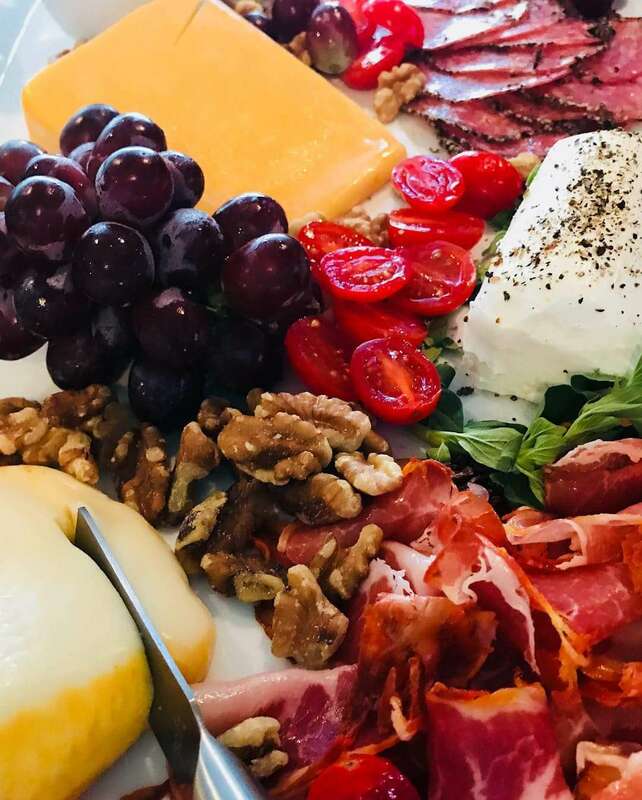 We enjoyed lamb chops, Thai curry lobster, shrimp linguine, strawberry crepes, eggs hollandaise, beef burritos, tuna ceviche and many other items throughout our week. Lesley baked me a surprise red velvet cake with cream cheese frosting for my birthday and she decorated it with candles and fresh flowers. Thank you for making the booking process, planning, and execution of our contract so simple. The packing lists and preference sheets were helpful. 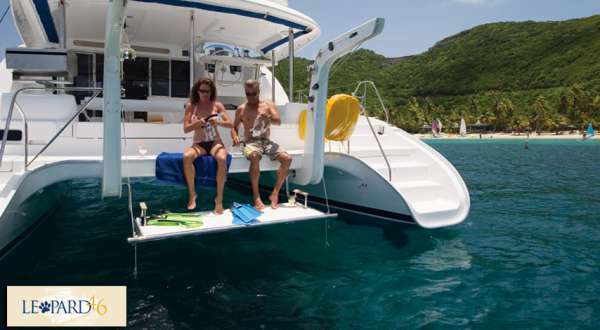 I would highly recommend Carefree Yacht Charters and the ExtaSea 2 to anyone who wants to enjoy the BVI by catamaran. We hope to sail with Mike and Lesley again soon! 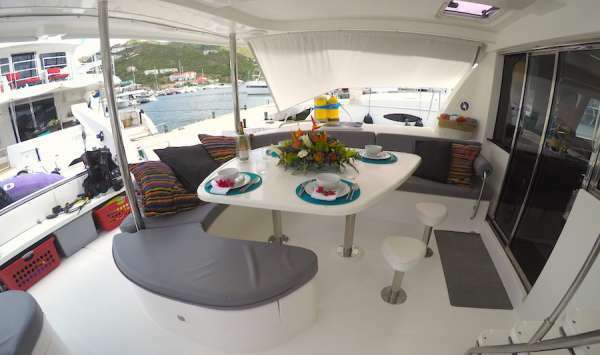 It was another fabulous charter in the BVI! Mike and Lesley were great. Very friendly and accommodating. Mike had a plan for the week but every day he checked with us to see what we wanted to do. 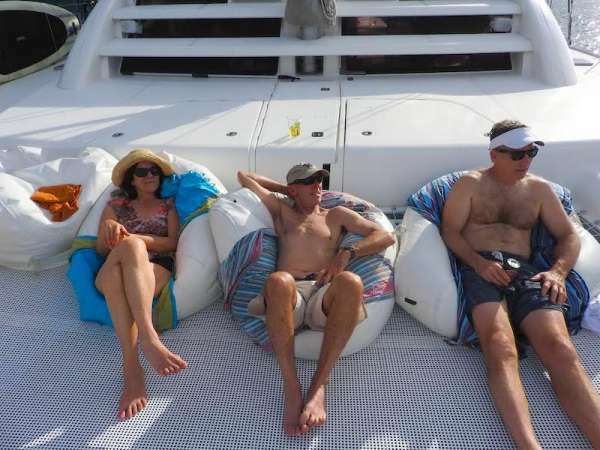 He wanted to take us to Anegada for the beaches but when the seas turned rough he gave us a second option to stay on the north side of Tortola. It was a good recommendation and we found some fun beaches to snorkel and kayak that I had not seen before. Mike is a very comfortable dive master. Katy and I did two dives and Mike would have done a few more if we had asked. I had confidence in him and he was happy to see our skill level. 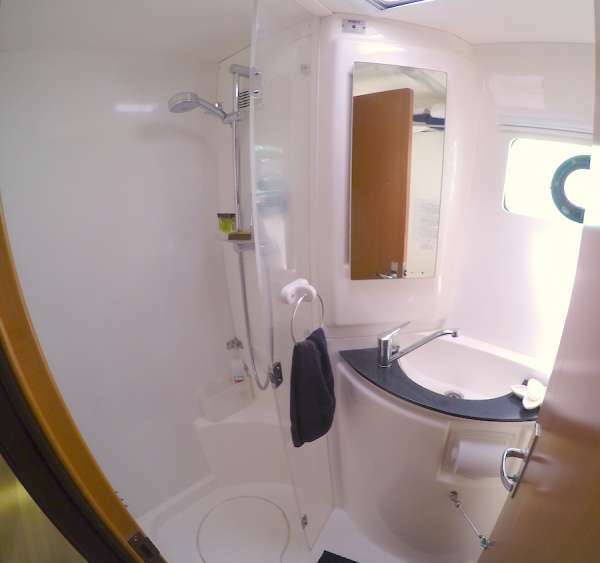 The yacht was very clean and comfortable. Lesley works hard and she slipped down to make beds and clean our bathrooms every day!! The food was fabulous! Lesley was so good to accommodate our goofy crew. They really read our preference sheet and met all of our requests. Lesley is a kind grandmother herself and she loved our granddaughter. Offered to keep her! Meals were great with Mai Mai, snapper, steak and even Tai food one night. Every meal had a "starter" and a dessert! Lots of fresh chopped foods. Besides accommodating a 9 year old Lesley did a fabulous job of feeding our daughter who has celiac. She tries to deal with it quietly by just passing up on anything with gluten. Lesley also eats gluten free so she had a good understanding. Every dish had an alternative for our daughter to stay away form gluten. Even cookies, bagels and pasta. It was so nice not to feel that she had to do without. Lesley was great! She decorated every plate with flair using fresh herbs that were growing in a basket on her counter. Every salsa, sauce or topping was made of fresh chopped ingredients. The fruit smoothies in the morning hit the spot. Then we were offered muffins, eggs, bacon and sausage!! Too good to resist. Mike and Lesley did a great job of dealing with our group of 4 over 70, one who was 40 and a 9 year old. We were three generations and a couple of friends! We ALL had a great time. This was the perfect crew for our group! 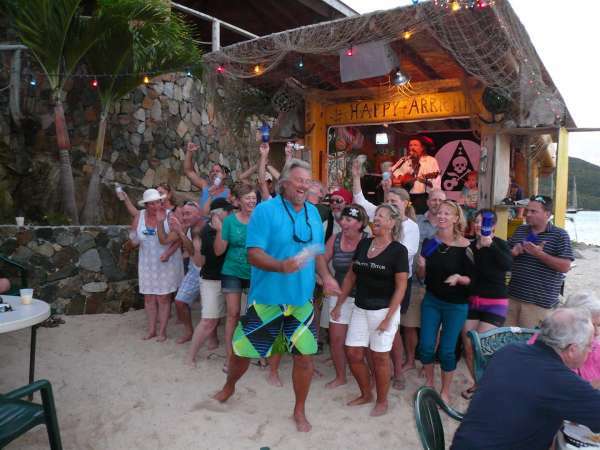 We like the party life too so Mike took us to the Willie T, the Soggy Dollar and Foxy's. Mike is a great bartender! We went through his rum making Dark and Stormy's and he just made a dinghy run to pick up more. He was always offering to mix up something or to pull out a beer. Thanks for finding this yacht for us. We really had a fabulous time! Lose 10 pounds before you go because you eat very well. Don't over pack which we all did. All you need is a t-shirt, shorts and swim suit. 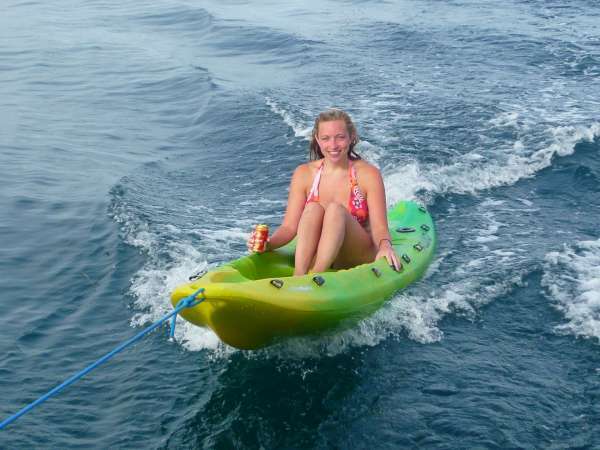 And finally have fun and drink a lot of rum! 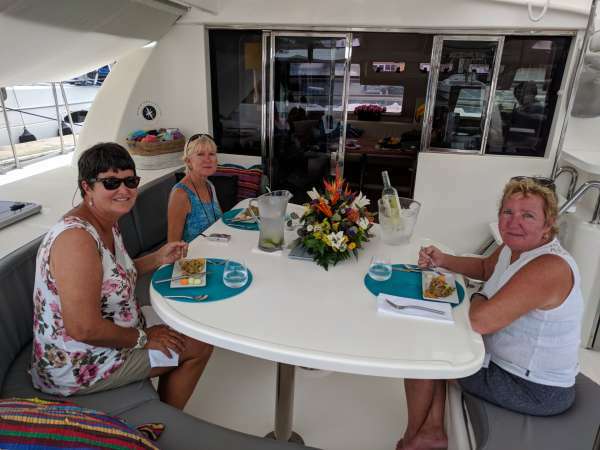 Lynne, first I want to thank you for recommending Mike and Lesley, and their yacht the ExtaSea 2 for our charter. The entire trip completely exceeded our expectations and much of that was due to Mike and Lesley. They quickly understood our goals for the trip and helped us plan a great itinerary that we all fully enjoyed. 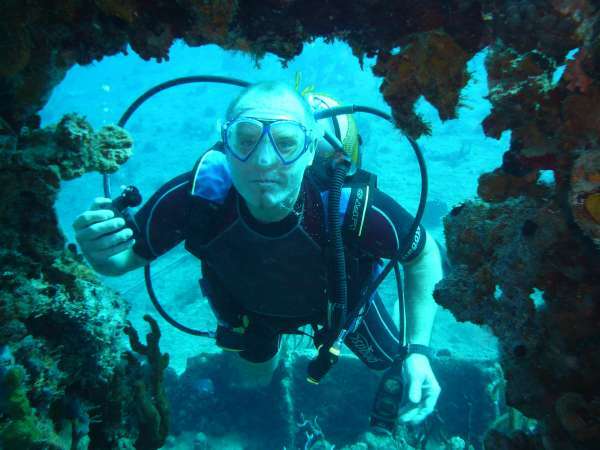 Mike was a great dive master for my 2 daughters who were making their first ocean dives since being certified. He knew exactly which dive sites to take them to in order to get comfortable in the water, and then we dove the RMS Rhone which was a highlight for all of us. Lesley is a fantastic chef and every meal was so great that it's hard to pick a favorite (the molten chocolate cake is definitely near the top). 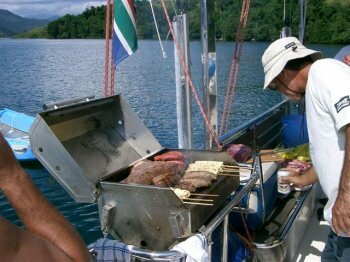 The variety of foods and cuisines she prepared were world-class and we've never eaten so well on a trip. 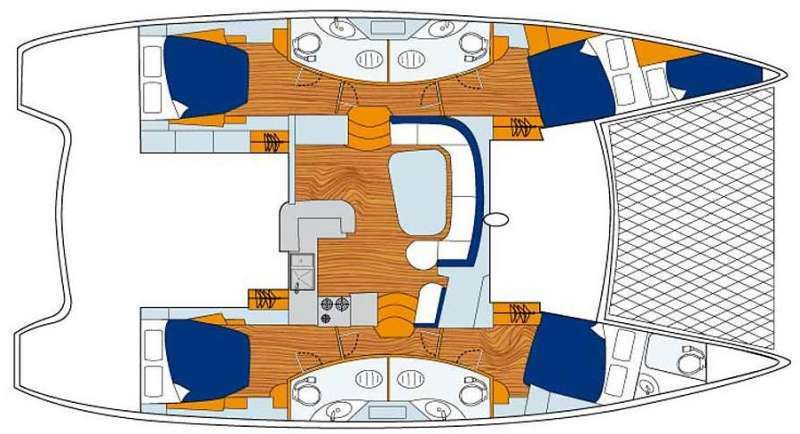 I would highly recommend them and their yacht for anyone that is looking for a memorable and fun week. Thank you again for helping us create such a great trip!